Bernie Düenwald is not a T-shirt guy. He doesn’t like the feel and never has. 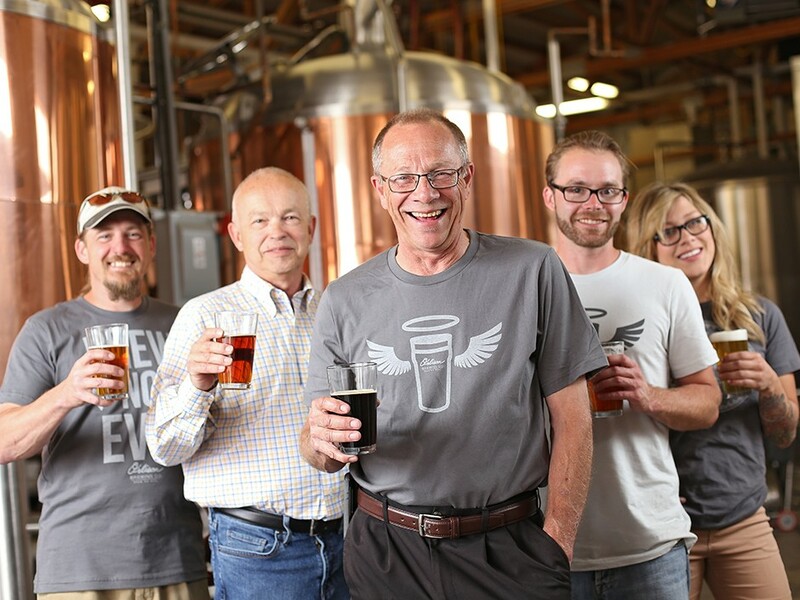 That’s why in the days after his company announced it would now be known as Orlison Brewing, his staff is decked out in the rebranded brewery’s hip new apparel, but Bernie’s worn polo shirt still bears the Golden Hills logo. The company’s operations guy, Mark Borland, finally gets him to put on the Orlison T-shirt, but only because he’s about to be photographed for this article. Düenwald, Orlison’s brewmaster, is still getting used to some of the changes. There have been several in the past six months, but all of them seem to be good things, many much bigger than mere T-shirts. Soon, Orlison will drastically increase production, arrive on taps all over the region and be the first Inland Northwest brewery to put beer in cans. What hasn’t changed is the beer itself, craft-made lagers aimed at bringing a more accessible yet still high-quality beer to a region whose taste buds and purchasing habits have been bulldozed by hoppy ales. At the end of last year, Düenwald was at a crossroads. A Dartmouth-educated scientist originally from Reardan, he sold malts to breweries around the world before starting Golden Hills in 2009. Over the years he served as the brewmaster, salesman and deliveryman and seemingly did everything else, but the money wasn’t coming in. Rather than close up shop, one of the company’s original investors, Orlin Reinbold, teamed up with another investor, Jason Miller, to pump cash into the brewery. In recent weeks, they announced plans to drop the Golden Hills moniker and combine Orlin and Jason to create Orlison. Now the brewery has a staff of three in addition to Düenwald and is making a push to bring quality lagers to the beer-swilling masses. People will approach Düenwald skeptically at beer festivals, believing his lagers are going to be a modified Bud Light. Then he gives a quick lesson about lagers, and after a sample has been handed out, he’s typically converted an IPA lover to his beers. “So really, some of our job is education,” says sales director Rachael Provance, sitting atop a stack of kegs in the back of the brewery’s spacious warehouse in Airway Heights. Lagers, typically lower in alcohol content and calories than ales, are — contrary to what some might believe — more difficult beers to brew. For one, it takes an extra week or more to make a lager, as opposed to an ale. A lot of the ingredients are the same, but the process is more delicate and labor-intensive. “Nobody would like an un-hopped beer. You need the hops to balance the malts. But you get to the point with some of these really hoppy ales where you can’t taste the difference,” says Düenwald. Orlison’s beers can be light and crisp like Clem’s Gold, or full-bodied and spicy like the 7 Seventy India Pale Lager. And their Lizzy’s Lager just took home a gold medal from the Washington Brewers Festival. “The timing is good in the U.S. right now for us because we’re unique,” says Reinbold, arriving at the brewery from Landmark Turf & Native Seed, the company he operates on a full-time basis while serving as a partner in Orlison. That uniqueness might be what buoys Orlison as the craft-brewing boom continues. As of 2012, there were 158 breweries operating in Washington, and production in the state jumped by nearly 24 percent in 2012 alone. But almost all of these breweries are making ales, which sets Orlison apart. Come August, the brewery’s lagers will be available in sleek 16-ounce cans, making Orlison the first area brewery to opt for cans over bottles. As Düenwald, Borland, Provance and brewer T.J. Brown — who got his start assisting Düenwald in exchange for beer — sip beers on a storm-threatened afternoon, they talk a lot about the brewery’s future. Düenwald is still wearing his Orlison T-shirt. The Golden Hills polo has been tossed aside, soon for good. People need to see this new name, and he knows that all too well. “You can have the best beer in the world, but it doesn’t matter unless you get it out there,” says Düenwald, taking a sip of lager, taking a second to stare down into it as if, indeed, it is the best beer in the world. Which is the first Inland Northwest beer in cans? Speaking of Orlison Brewing Co.
VIDEO: Pilsner 37 canning day at Orlison Brewing Co.